By popular demand, in 2017 we've added a post phase inverter master molume control to the Chimey Limey. This control tames the overall volume when needed, but please be aware, the CL is very much an amp about preamp and power amp working together. The preamp does not have a lot of gain so you won't get saturated distortion at bedroom volume, unless you put a pedal in front! If you prefer that type of thing, check out our Dual Melvin, Melvin Jr., Wicked Garden, or Wicked Johnny. The CL series amps were developed to deliver the magical bloom, chime, and grind of the coveted British amps from the 60's, but in more abundance and with higher quality than the currently available offerings from "the big V". 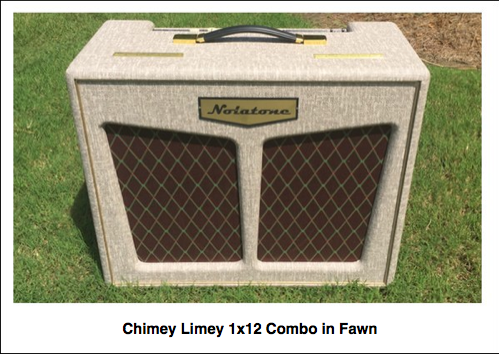 Part of why we chose the 1960 version of the "AC" amps is the pure tone of the more simple circuit vs the more complex (though still wonderful sounding) Top Boost circuit (Top Boost channel is now available in our Chimey Limey "In Doubly"). However, part of the magic of the 1960 circuit is also part of the problem with that version as well, the EF86 pentode tube. The EF86 pentode sounds amazing and works great with pedals, but it is unreliable and prone to microphonics. I suspect that's part of why the "V" design changed to use a 12ax7 triode input stage later in that decade. We've discovered a technique for wiring a dual triode externally to operate as a pentode (like the EF86!). We use a 12dw7 (JJ ecc832) tube which is readily available as a new production tube. The result is the same level of gain and dynamics of the ef86 without the unreliability and microphonics. It also offers the same great prominent boost characteristics when engaging the Chimey Limey's boost mode. The result is what many consider to be the best "V" style amp available today. The Chimey Limey offers the epitome of "V" goodness. Huge, 3-dimensional cleans that bloom and breathe, revealing even the slightest nuances of your guitar, pickups and hands. If jangle is your thing, it's there too, just grab your Ric, click the tone clicker down to reduce the bass and you've got instant Mr. Tamborine Man. 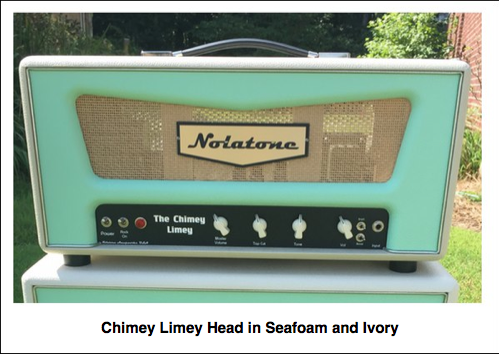 When pushed the Chimey Limey smoothly transitions into some of the most beautiful, sweet, and dynamic chimey power tube overdrive you are likely to hear this side of the 60's! The 15 watt version offers this at a more reasonable volume level than the 30 watt of course. Though the 15 watt version comes standard as a 1x12, pairing it with our 2x12 split panel birch ply cabinet takes things to a whole new level. Load it either with a pair of 15 watt WGS Black and Blue Alnicos, or one Black and Blue and one Blackhawk 50 watt Alnico...glorious! 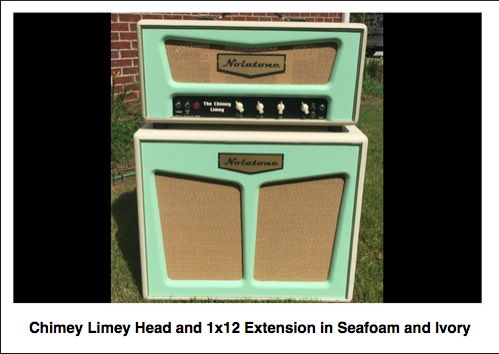 Plug into a Chimey Limey and you will immediately understand how it got it's name!